HTC Incredible S S710E is currently not available in any stores. Listen to your favourite songs in music player. It supports MP3, AAC, WMA, WAV, M4A (Apple lossless), AMR, OGG, MIDI etc. file types. The HTC Incredible S has all the ingredients of a great smartphone. A large screen with great image quality, powerful hardware under the hood and a decent camera with HD video recording sounds like a great formula for success. It also provides a solid user experience so all seems fine, right? 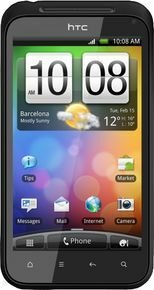 The HTC Incredible S features a crisp 4-inch, Super LCD multitouch screen. The HTC Sense UI provides a slick user experience and generally snappy performance. The Incredible S runs the older Android 2.2 OS. Call quality and camera quality could be better. Though it has a generous screen and high-end features, the Incredible S is more pocket-friendly than its larger cousin, the Desire HD, both in terms of price and footprint.